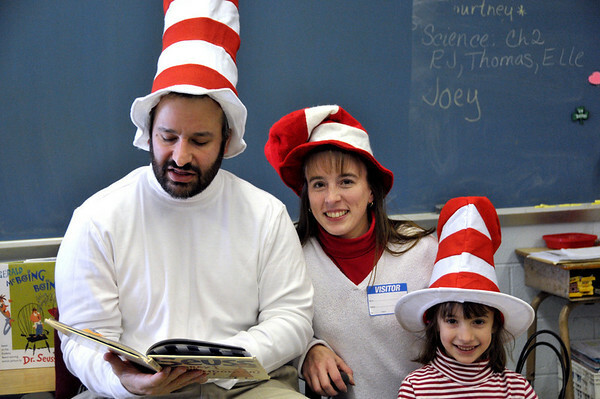 I spent the first part of this morning at my daughters' school which was celebrating Dr. Seuss day. I had the wonderful privilege of being able to read to Katie's second grade class. I wore my very own Katz in the hat hat and brought my own supply of books for the kids to choose from. Their first choice out of the four books I brought was "Hooray for Diffendoofer Day!" which won the vote 12 - 11. Katie got to sit next to me while I read the book and all the kids in Ms. Bajzath's class were very well behaved. They oohed and aahed as I read the book and showed them the pictures and were very impressed that I was actually in the book "Our science teacher Mr. Katz...." Not all the readers in school that day got mentioned in a book. When we finished the story I showed them the original pictures that Dr. Seuss has drawn for the book and they were fascinated by it. Since the vote was so close I felt the need to read their second choice "Horton Hears a Who!" too. Truth be told I was just having so much fun I figured I would stick around a little longer. They continued to behave well and even helped while I read "a person is a person no matter how small!" They all piped up and said small with me. I really enjoyed my time in Ms. Bajzath class and only had one hiccup all day. I had taken my glasses off when I started to read and when I finished they had disappeared from the table. We looked everywhere and the class helped too but they were no where to be found. I found out later that Ms. B had stolen them. She had picked them up as her own and put them on her head. Later she grabbed her other glasses and when she tried to add them to her head she found the first pair. A very real life embarrassing Seussian moment. Katie told me the whole class laughed at her.